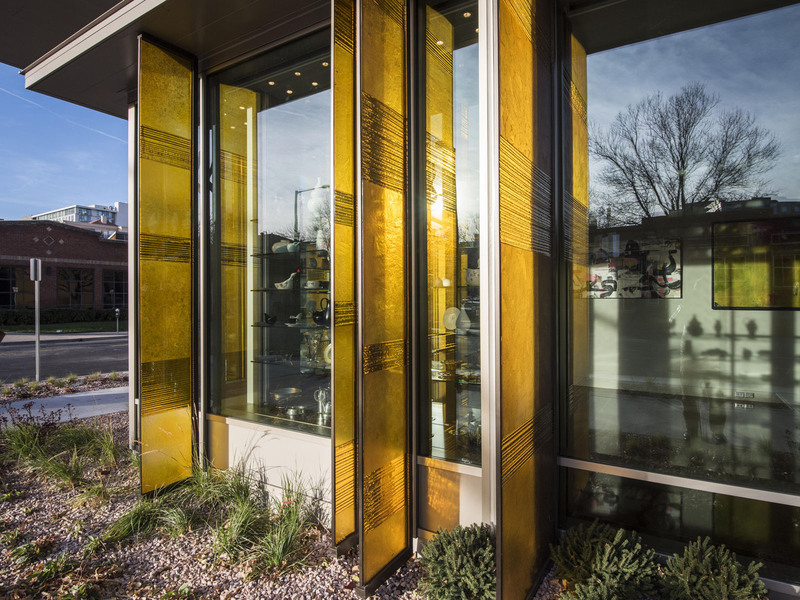 Olson Kundig creates dynamic terracotta pattern at Kirkland Museum in Denver - Facades+, Premier Conference on High-Performance Building Enclosures. 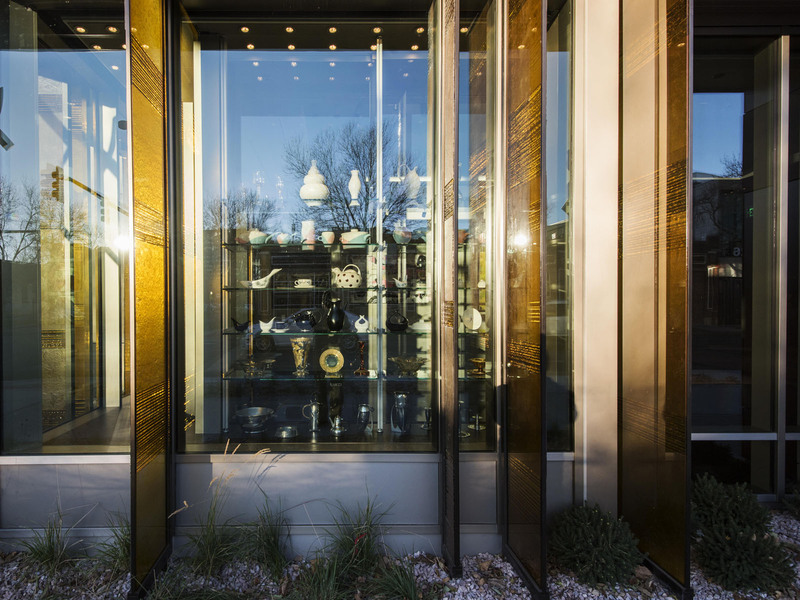 “How does a little building for decorative arts hold its own next to big icons?” asked Jim Olson, partner at Olson Kundig. 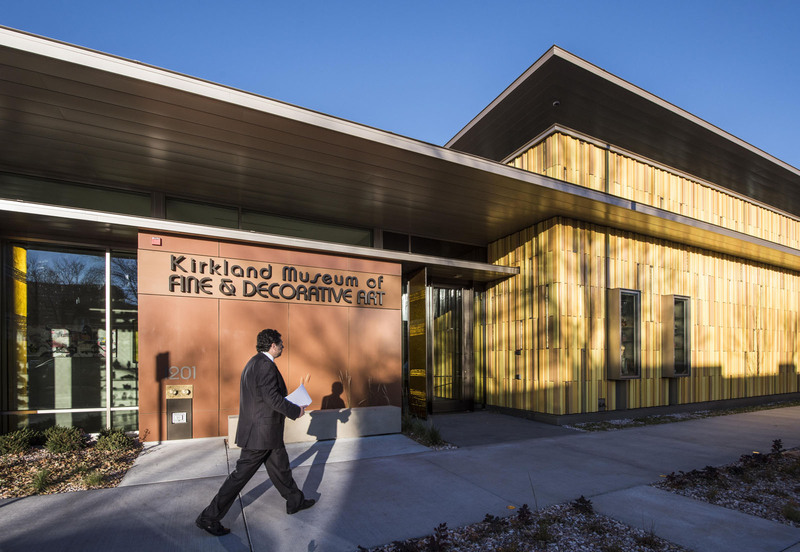 This was the challenge that Seattle-based architects were tasked with when they took on a project to design a new space for Denver-based Kirkland Museum of Fine & Decorative Art to move into. 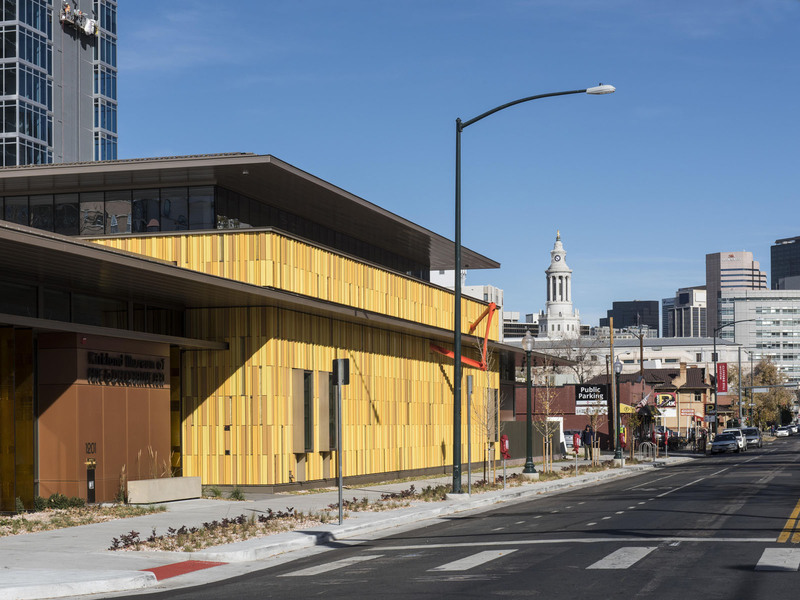 The project site sits in the shadows of two major civic projects from Daniel Libeskind and Michael Graves – the Denver Art Museum, and Denver Central Library respectively. 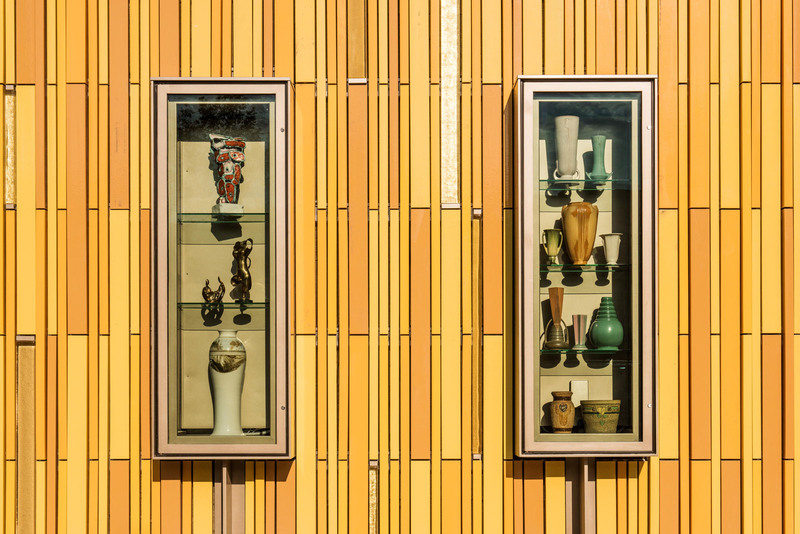 The project departs from a typical glass-dominated Olson Kundig project with a desire to create a controlled gallery-style lighting environment and a protective space for the art objects housed within the museum, with the building envelope assuming a more opaque character. 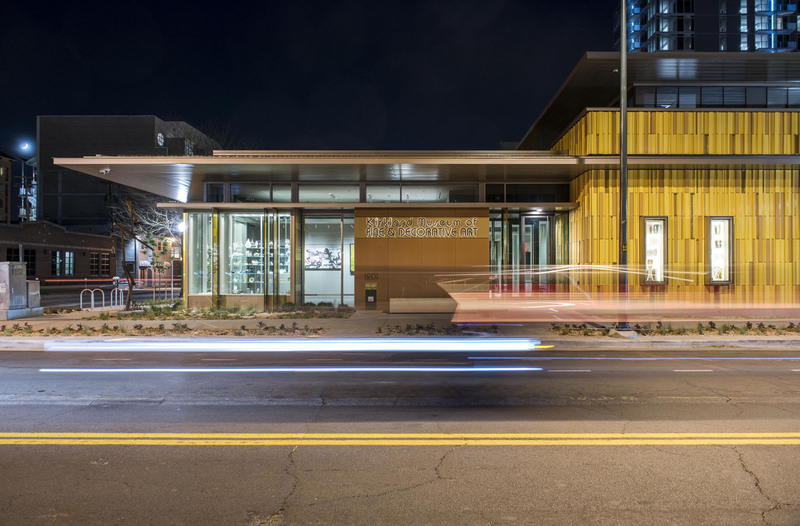 “We started referring to this project as the jewel box,” said Crystal Coleman, project architect at Olson Kundig. 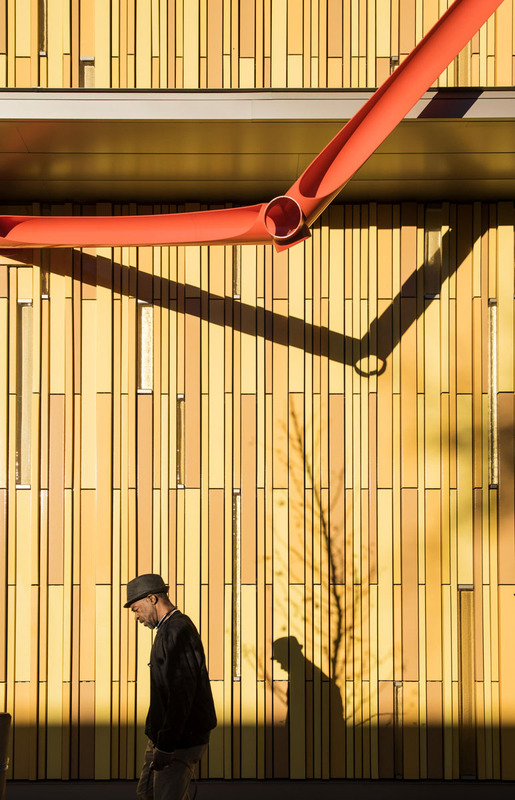 The architects pulled from a range of yellow and gold hues inspired by the environmental conditions of Denver, which receives 300 days of sunshine per year, and “energizing” color palettes pulled from Vance Kirkland paintings. 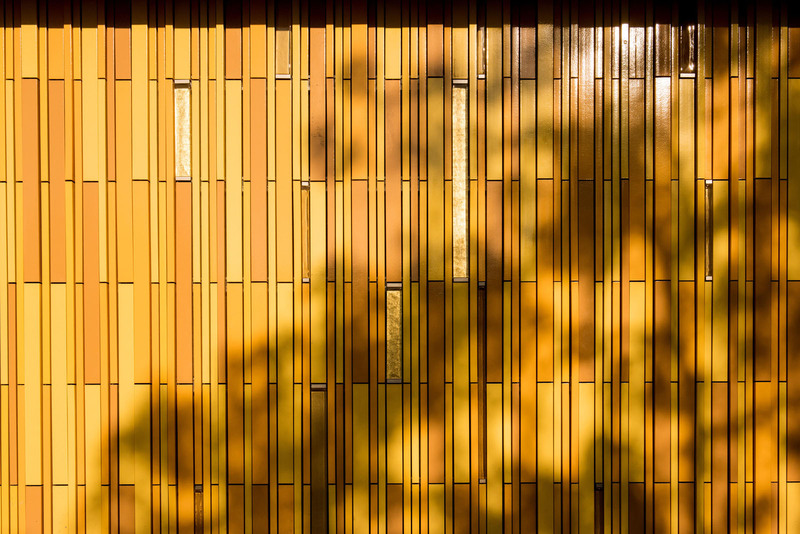 The facade is a relatively typical rainscreen system composed of wall connections, girts, and clips from NBK Terracotta. 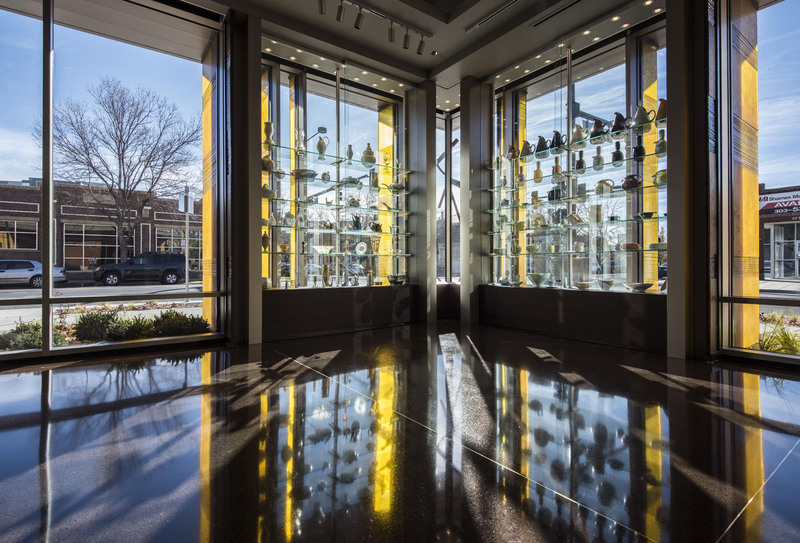 The system was customized by the architects and collaborator John Lewis Glass, who developed custom decorative glass inserts. 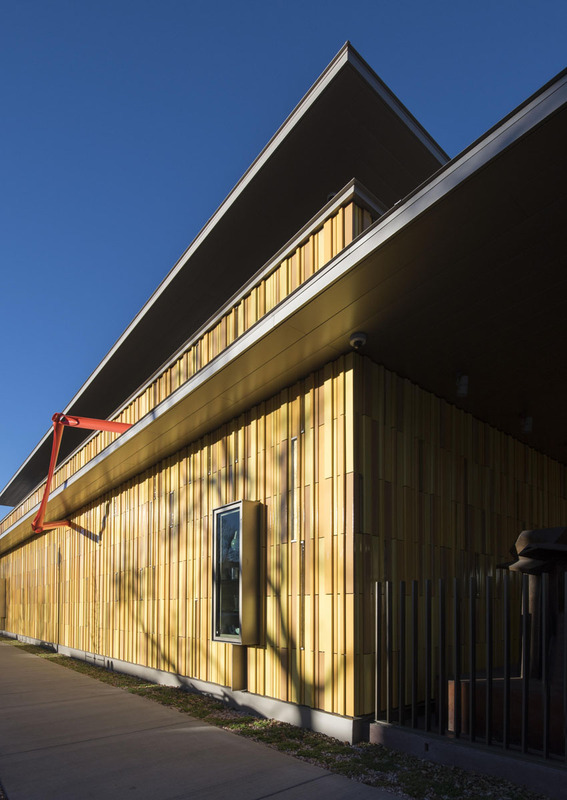 Introducing custom material into NBK’s rainscreen assembly was a collaborative process, requiring coordination between suppliers, manufacturers, installers, and contractors. The composition of the facade is organized systematically to achieve a randomized effect through the manipulation of patterns. 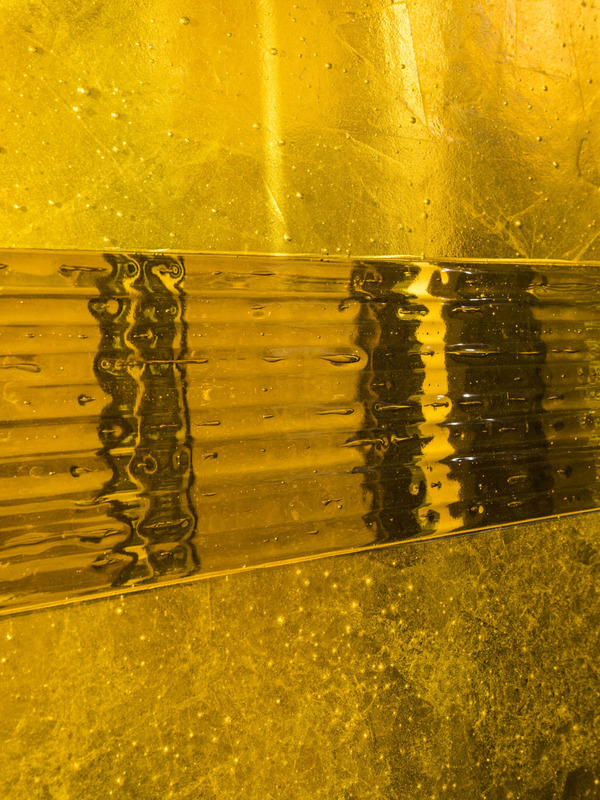 Two approximately four-foot-wide modules were first developed to achieve a “random” compositional effect. These units were distributed across the facade and overlaid with two additional patterning effects that were applied in a mirrored fashion. Ultimately this produced a variable arrangement across baguette widths, depths, heights, and colors to produce a dynamic texture. 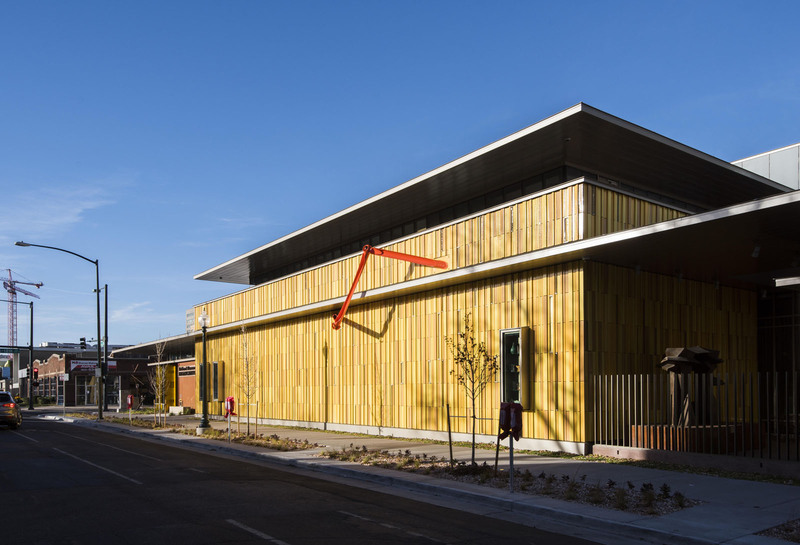 The facade is capped by large roof overhangs, producing deep soffits. 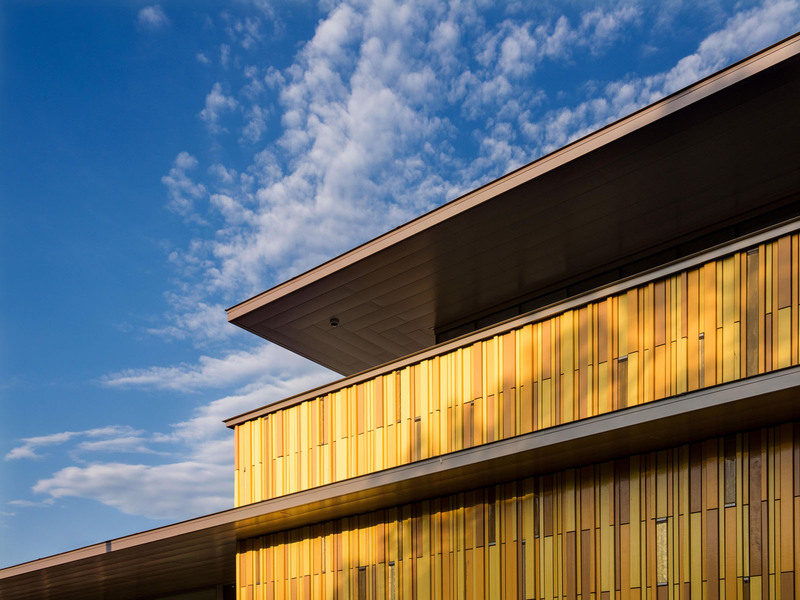 The soffits, almost always in shadow, are clad in a deep bronze anodized metal panel that allows the roof to visually recede from the vibrant facade. 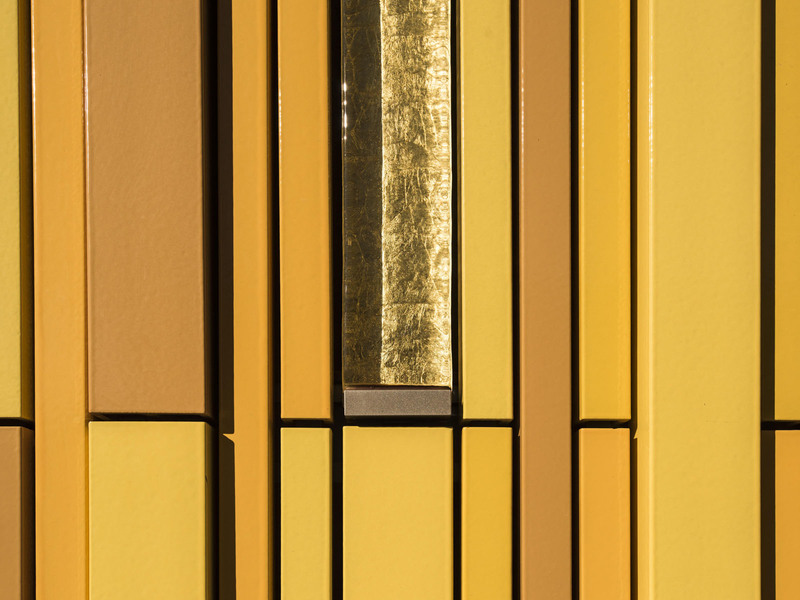 The cladding is arranged in a unique herringbone pattern at the corners, developed by the metal panel manufacturer and installer through a series of mockups. 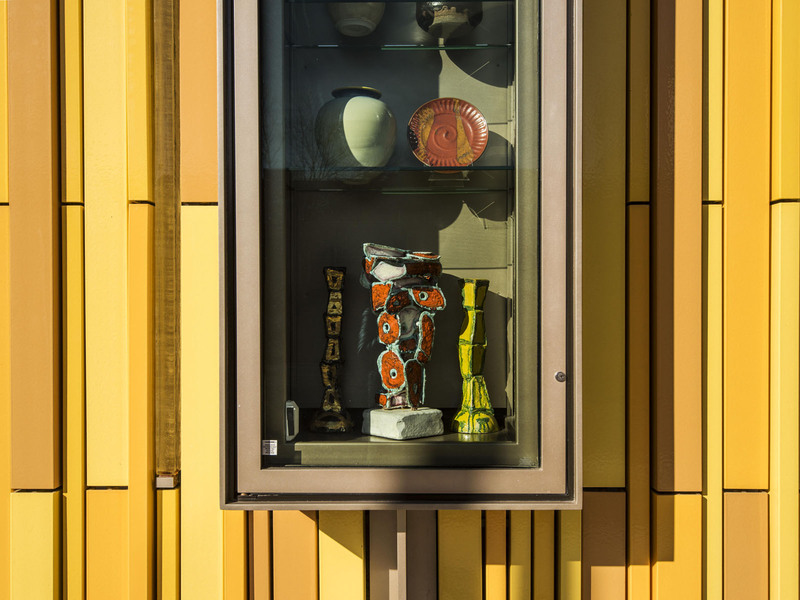 A key feature in the project is a sculpture by artist Bob Vangold acquired by the museum late into the project during construction. 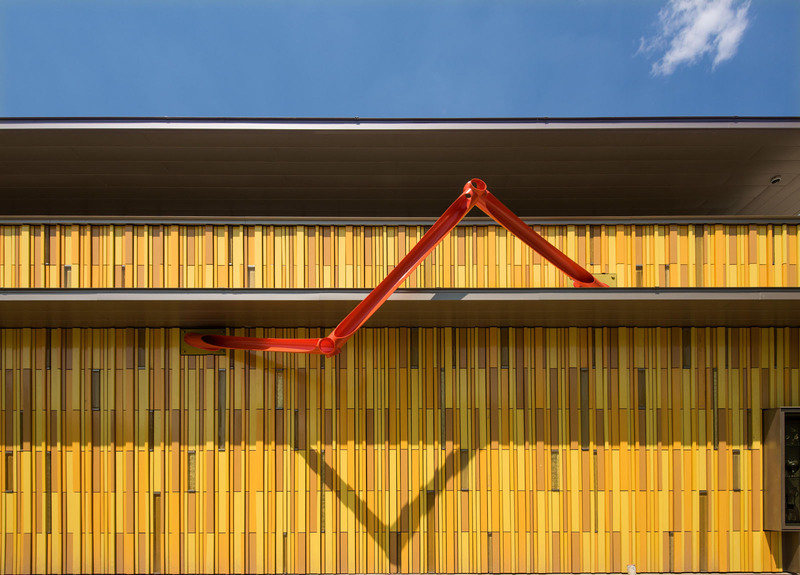 The architects scanned the artwork and positioned the object onto the facade, bridging a continuous horizontal roof edge. The piece is anchored to the facade with base plates. Water collection and durability, with respect to stormwater retention and structuring of the sculpture onto the facade, were carefully evaluated by the owner, structural engineer, and architect.